Kenya Travel Stories - Where the fun begins! 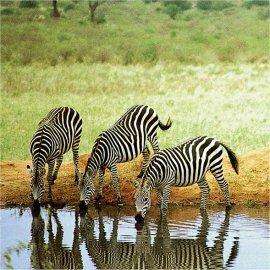 The Kenya Travel Stories Archive is the place to get all excited about your travel plans to Kenya. Get travel ideas, tips and warnings from these Kenya travel stories. What's YOUR single best Kenya travel experience? My wife and me had been dreaming about going Africa for years. When some old friends called and said they wanted to organize a trip, we took the invitation immediately and joined them. Now our dream finally came true. We very much wanted to experience the Swahili culture in Kenya, so we decided to stay a week in Kenya at the coast. Having visited other parts of Africa the week before, we flew in from Nairobi. My friends had left for the coast a few days earlier than me, and found a wonderful beach resort there, Moonlight Bay Beach Resort at Tiwi Beach. 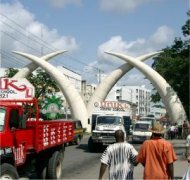 They had picked Tiwi Beach because it’s much more quite there – fewer tourists – than for example Diani Beach, which is also south of Mombasa. This part of our Kenya travel story is about our safari to Tsavo East and West – me and the two couples I was traveling with. We were staying near Mombasa and trying to determine which park we would pick for a safari. The others wanted to do a budget safari. I didn’t mind as everything was new to me. Tsavo seemed a logical choice because they are geared towards budget travelers more than the other parks, and because they were relatively close to Mombasa. We didn’t have the money to fly into a park and had to go by car… And because of the bad roads, traveling by car is taking much more time than you’d think. Plus the combination of Tsavo East and West seemed good: The first because it’s better for animal spotting, the second because of the scenery. With 2 friends I went to the World Social Forum in Nairobi (January 2007) and as we had to pay the trip ourselves, we combined it with a vacation. The city was crowded with WSF visitors and most hotels were fully booked months in advance. We were late with finding a place to stay. Luckily an Italian friend of mine, who was often in Nairobi for her work, found a place for me. It was her own apartment in the Longonot Apartment complex, next to the famous Norfolk Hotel at the Harry Thuku Road. She had rented it for some time and as she came back to Italy, she knew it was empty. We got it for 50,000 shillings (some 700 dollars) for the whole 10 days. Our flight was delayed for 8 hours and we heard the flight crew protesting that they still had to fly to Nairobi, as they had a long shift…. When the speakers announced that the crew had decided to follow through with the flight, a massive applause went up and we could board the airplane, a big Boeing 747. What's YOUR best travel experience in Kenya? And if you have a picture to go with it - even better!